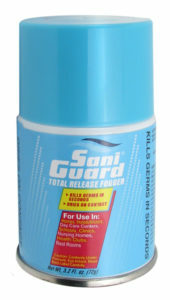 The SaniGuard® Total Release Fogger sanitizes an entire room, vehicle, or area in mere minutes. It’s easy to use fogger spray that gets rid of disease-causing microbes almost instantly. The SaniGuard Fogger commercial disinfectant spray is the world’s first and only dry on contact spray sanitizer and deodorizer. It has the same kill on contact power of the conventional SaniGuard® sprays. SaniGuard® effectively kills 99.99% of the top 39 germs, bacteria, viruses & fungus in mere seconds. It is safe on any surface, including fabrics & electronics, making it great for use in transportation vehicles. It does not leave any residue behind. Get rid of disease-causing microbes quickly and easily with the SaniGuard Fogger. The SaniGuard Fogger ingredients are listed here: Proprietary propellant, proprietary alcohol, isopropyl alcohol, quaternary ammonium compounds, benzyl-C12-16-alkyl dimethyl, and chlorides. *Note: This information comes directly from the SaniGuard MSDS Sheet. Some of the ingredients are proprietary information (trade secrets), so name and identifier are listed as proprietary. The classification of the material is listed in the composition/information on ingredients chart on page two of the SDS sheet. Click the link to view the full SaniGuard Fogger MSDS sheet PDF. Disinfecting areas where people work, play, and eat is important, especially in areas where bacteria, viruses, and funguses are likely to grow. SaniGuard foggers kill the following list of bacteria, viruses, and germs. Close all outside windows and doors. Use one (1) container for each area depending on which size fogger you are using. Elevate fogger by placing on a stand or table if possible (maximum 2’ off ground). Tilt away from face before activating (container sprays straight up). Press down firmly on the edge of the actuator tab until it locks into place, then set fogger on floor, stand or table. Leave the area immediately after activating fogger. Keep treated area closed for at least 15-20 minutes before returning. We recommend using the treated room again one hour after treatment was started. Buy SaniGuard Foggers from Equiparts! We carry two different sizes: the 3-ounce fogger, which is designed to sanitize areas up to 125 square feet (12 x 12 x 8-foot dimensions), and the 8-ounce fogger, which is designed to treat up to 625 square feet (25 x 25 x 8 foot dimensions). Both of these sizes are available in 12 pack cases. See the part numbers below for the various sizes and quantities. Be sure to reference the part numbers when calling to place your order. 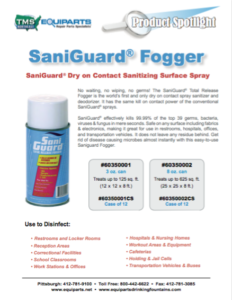 Call to Order your Saniguard Fogger Disinfectant Today!